CLEVELAND (CN) — Green Bay Packer defensive lineman Mike Pennel, facing discipline for an alleged violation of NFL substance-abuse policy, sued the league Tuesday, asking that his appeal be heard before a court-appointed arbitrator — not the one chosen by the NFL and his player’s union. Pennel sued the NFL, the NFL Players Association and the NFL Management Council in Federal Court, seeking declaratory judgment under the Federal Arbitration Act. The lawsuit does not specify the nature of the alleged violation, other than substance abuse. 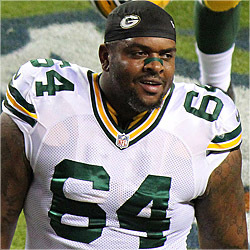 Pennel, 6-foot-4 and 332 lbs., is in his third year in the NFL, all of them with the Packers. In February this year, he was suspended for the first four games of this season, for alleged violations of the substance-abuse policy, according to the Milwaukee Sentinel. In his Tuesday lawsuit, Pennel says he was notified about the pending discipline in a letter he received on Nov. 8. His attorneys appealed on Nov. 11. NFL policy requires that “no fewer than three but no more than five” arbitrators hear players’ appeals of alleged substance abuse violations. But the NFL Management Council informed him that only two arbitrators are available to hear his appeal, which is set for Tuesday, Dec. 5, via teleconference, according to the complaint. NFL policy also stipulates that the three to five arbitrators must choose one member to be the “Notice Arbitrator,” who assigns the appeals and ensures that at least one arbitrator is assigned to work every Tuesday of the playing season through the Super Bowl. Pennel entered the league as an undrafted free agent in 2014. Email correspondence between his attorney and the NFL indicates that Pennel objects to “Arbitrator Carter” and the manner in which Carter was appointed: i.e., by the NFL, not by fellow arbitrators. He asks the court to appoint a “neutral arbitrator” to hear his appeal. Pennel’s attorney, Stephen Zashin, did not immediately respond to a phone call seeking comment. An attorney for the NFL Management Council did not respond to an email request for comment. Zashin is with Zashin & Rich, in Cleveland.